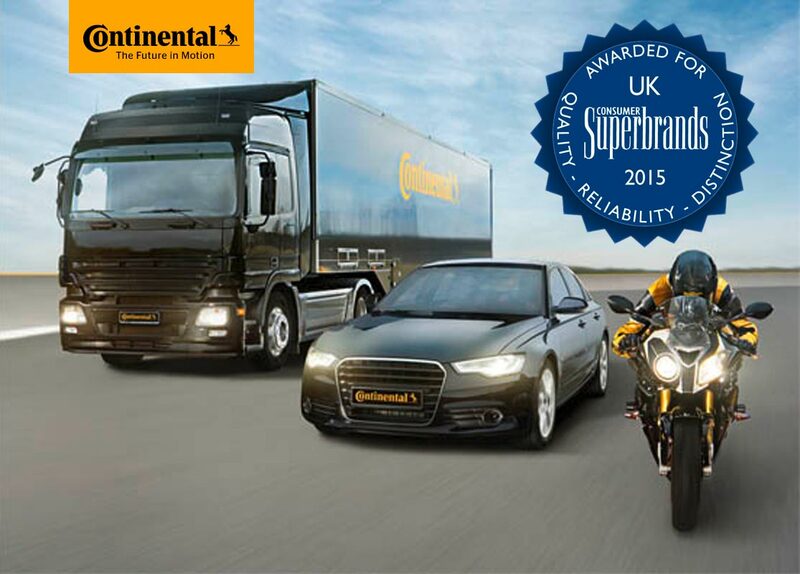 Respected annual Consumer Superbrands® list features Continental Tyres among the UK’s strongest consumer brands. Continental Tyres has been awarded Consumer Superbrands status for 2015, following the most recent evaluation of the long-running annual survey, which has been identifying the UK’s leading brands since 1995. The process, managed by The Centre for Brand Analysis (TCBA), questioned 2,500 UK consumers who assessed more than 1,500 brands. Consumers judged the brands on three key criteria: quality, reliability and distinction. Guy Frobisher, Marketing Director of Continental Tyres said, “With over 140 years experience, Continental has a rich heritage of developing technologies for transporting people and their goods. Superbrand status is a huge honour for Continental and embodies a business that puts safety first, winning 4 in 5 independent tyre tests across Europe. Our innovative approach has resonated well with consumers, who now see the brand visible across a range of partnerships in Football and with Continental rubber compound featuring on many soles of adidas trainers.